Monday’s ad is for Pabst Blue Ribbon, from 1953. Starting in the early 1950s, Pabst started a new ad campaign with the tagline “What’ll You Have” which lasted for a few years. They were colorful ads, and often had the tagline spelled out in creative ways. 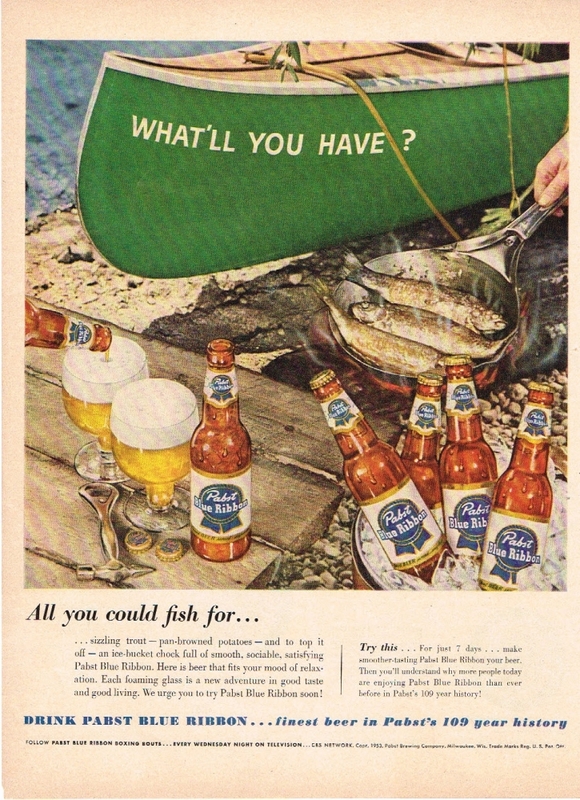 In this ad, “What’ll You Have” is written in the side of a green canoe. It looks like they’re grilling fish they just caught with six bottles of Pabst and two filled beer glasses. Also, check out the bottle opener that’s also a hammer.